Demand is on the rise worldwide, but the supply has been affected by the weather. "New Zealand harvested less this campaign after a difficult growing season, with a hot winter and a lot of rain," explained a trader. Moreover, the Chilean production is also reported to have dropped, and now Italian kiwis are hitting the market and they also expect a smaller volume due to the impact of frost in certain regions and the dry summer. "As a result, the supply will be much scarcer, while the demand continues to rise," assures a trader. Zespri, the export organization of New Zealand kiwis, is seeing strong growth this season. The SunGold continues to grow in markets like Japan and China. Moreover, their sights are set on other markets in South East Asia, India and North America. The European market is also developing well, with strong demand all year round. Japan is the biggest market this season, accounting for the export of 23 million trays. The second most important market is China, accounting for 22 million trays. The start of the season in the northern hemisphere is around the corner. The Italian volume is expected to amount to around 5 million trays, which is a notable growth. The company aims for the demand to grow faster than the supply, and that seems to be successful. As a result, priorities have to be set as far as the markets are concerned. For the coming years, significant expansions are expected in the acreage, with another 1,800 hectares in Europe and 400 hectares in New Zealand. The company is working on growth for the SunGold. Eventually, the share of green and yellow kiwis must be split 50/50. In an early estimate for the coming season in California published earlier this month, the volume was expected to remain fairly stable. The prospect is for 30,449 tonnes of kiwis to be harvested, compared to 31,324 tonnes last year. According to some, this is a conservative estimate. The State is the leading kiwi producer in the US and accounts for 98% of the production. About 80% of that fruit is intended for the domestic market. A small volume is exported to Mexico, Canada and Japan. The first California kiwis hit the market at the end of September. The season lasts until April. In these months, some small volumes are imported from Italy and Greece. For Zespri, Italy is an important growing site for the SunGold. Between May and October, kiwis are imported from Chile and New Zealand. The demand for kiwis is good this year. The green kiwis have a good demand, but the biggest growth in this regard was recorded by the yellow varieties. Last week, the harvest started for the early green varieties, like the Green Light. The volumes are still small. The Hayward harvest will kick off in mid-October. From that moment on, the volumes will be comparable to last year. Although limited volumes are currently available, exporters are taking advantage of the early end of the seasons in New Zealand and Chile. Therefore, there is a lot of demand with good prices. The frost in Italy has also been beneficial to Greek exporters, who have been facing less competition from Italy. Exporters hope to gain access to the Argentinian market this season. The most attractive market for European kiwis is Asia. The demand is especially high in the Chinese regions of Guangzhou and Shanghai. The volume of yellow kiwis is limited. The harvest started after the government issued a license. For this to happen, the brix content of the fruit had to be measured, explains a trader. On 14 September, the company was granted permission to harvest. For this company, the harvest takes about ten days. The supply of yellow kiwis is limited. In the coming years, the volume has to increase, but it is difficult to predict how the market will respond, according to a trader. Furthermore, all eyes are set on Asia. At present, the market is supplied with imports from Chile. The Spanish season won't start until the end of October or early November. The quality of the Chilean kiwis is good, according to an importer. He explains that the quality of Chilean fruit has been improving in recent years. In the past, Chilean kiwis were cheaper, but there is now almost no price difference with other countries of origin. European demand for Chilean kiwis is on the rise, but Chilean exporters also see opportunities in other markets, such as Latin America and Asia. The price is good, but there is a shortage of big sizes. An importer affirms that they need to find more fruit. 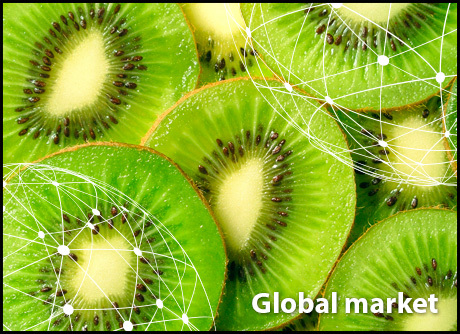 The Spanish consumption of kiwis is high, totalling 130,000 tonnes a year. The country itself produces about 20,000 tonnes. This offers opportunities to neighbouring Portugal, which is eager to export to Spain. The Portuguese season will begin with the first early kiwis in about 10 days. The Spanish harvest kicks off at the end of October. Production is expected to increase by 15% compared to last year. This is partly because last year was a bad season and partly because new plantings are coming into production. The fruit quality is expected to be good thanks to the dry summer and the cool autumn, but calibres will be smaller. Most of the kiwis on the French market are grown in the country itself. There are also imports from Italy and Greece. Shipments from New Zealand are much smaller, as European kiwis are on the shelves for almost 11 months a year. Most of the crops are found in the south of the country, where the fruit is harvested between December and early May. Thanks to cold storage, the fruit can be stored for 7 to 9 months. In addition to supplying the domestic market, there are also some small exports to Africa. The most popular variety is the Hayward, which barely faces any competition from the yellow varieties. Growers still have room for growth in the cultivation of kiwifruit. The European kiwi season has just started with a strong demand. During the summer months, the demand was lower due to the competition from summer fruit. In fact, the biggest competitor for kiwis tends to be the seasonal fruit; in summer, berries; in winter, apples and pears. In general, the year-round demand is stable. The price oscillates between 2.50 and 3 Euro, depending on the calibre, season and country of origin. Due to adverse weather conditions, the production in Veneto will fall by 20%. Besides, the sizes are mainly of the medium-small category. When it comes to the quality, however, growers are satisfied. In Calabria, uncertainty is the key word for the coming season. Lower volumes are expected for the yellow and green varieties. The harvest will start around 25-28 October. Choosing the right time to start harvesting remains a challenge. If growers pick the fruit too early, consumers will have to deal with poor quality fruit. Researchers also say that the protocols used for green kiwis are not suited for the yellow varieties. Green kiwis are harvested when the fruit reaches 7 Brix degrees, while for yellow varieties a minimum of 8 is needed. Canada has accepted the Italian phytosanitary protocols, resulting in the opening of this market to exporters. There were some uncertainties, but eventually the Canadians agreed. "Canada is a difficult market for kiwis, because imports are often made with an open price, which means that the price will be set afterwards, based on the market situation," explains a trader. This makes it difficult for Italian companies to estimate whether profits will be made. Besides, tests have also been carried out with exports to Mexico. All that remains is to wait until the protocols are approved so that the market can really open. "The demand is good and the supply of SunGold from New Zealand is sufficient to meet our customers' needs until early October," said a spokesperson for Zespri. Afterwards, the company switches to imports from France and Italy. The green kiwis from New Zealand are likely to be in the market until the end of November. At that point, the switch will be made to the European supply. This transition between seasons is expected to be "seamless." The campaign is already over. The volume technically fell this year, with a decline of 3.4% compared to the previous season. The export figure stood at 179.393 tonnes for the whole season. The biggest customer is Europe, accounting for 71,206 tonnes, followed by Latin America (38,593 tonnes) and the Far East (34,149 tonnes). The season kicked off early this year. In the first estimates, the production volume was expected to remain stable, even despite the smaller fruit sizes. Exports to China at the beginning of the season were marked by lower prices; an unusual situation, according to an exporter. Normally, the Chinese production starts struggling with quality issues at the end of the season and Chilean producers benefit from that situation. The European season went better, with high prices. The domestic season is over, but imported kiwis are available. The fruit is imported from countries like New Zealand, Italy, Greece and France. Green kiwis are still the most-produced in the country. The main cultivation areas can be found in the Limpopo Province. Between March and April there are also exports to the United Kingdom and exporters are looking for opportunities in the Far East. The kiwiberries are also becoming more popular among South African consumers. There are growers with big plans for the sector who aim for the country to grow into a net exporter. As a result, investments are being made to expand the plantations of yellow kiwi varieties. The goal is to be able to take advantage of the market gap that exists between February and March, before the start of the campaign in New Zealand.